On the Fourth Sunday of Great and Holy Lent we commemorate Saint John Climacus, Egoumenos (Abbot) of Sinai (6th Century), who is assigned a special Sunday in Lent because, by virtue of his writings and his own life, he forms a pattern of the True Christian Ascetic. Saint John is the author of The Ladder of Paradise, one of the spiritual texts appointed to be read in church during holy Lent. His memorial, like that of Saint Theodore, has been transferred to the movable from the fixed calendar, where he is remembered on 30 March. The first Canon at Matins (Orthros) on this Sunday is based on the Parable of the Good Samaritan (St. Luke 10: 30-35): the repentant Christian is likened to the man who fell among thieves. Hardly anything is known of the author, and the most reliable information about him can be summarized in the statement that he lived in the 2nd half of the 6th century, survived into the seventh, passed forty years of solitude at a place called Tholas; that he became Egoumenos (Abbot) of the great monastery of Mount Sinai and that he composed there the present text. The Ladder was written for a particular group, the Egoumenos (Abbot) and community of a monastic settlement at Raithu on the Gulf of Suez. It was put together for a restricted audience and to satisfy an urgent request for a detailed analysis of the special problems, needs, and requirements of monastic life. Saint John Climacus was not immediately concerned to reach out to the general mass of believers, and if, eventually, the Ladder became a classic, spreading its effects through all of Eastern Christendom, the principal reason lay in its continuing impact on those who had committed themselves to a disciplined observance of an ascetic way as far removed as possible from daily concerns. "Those of us wishing to stand before our King and God and to speak to Him should not rush into this without some preparation, lest it should happen that--seeing us from afar without arms and without the dress appropriate to those who appear before the King--He should command His servants and His slaves to lay hold of us, and to drive us out of His sight, to tear up our petitions and to throw them in our faces" (Step 28). "If you ever found yourself having to appear before a human judge, you may use that as an example of how to conduct yourself in prayer. Perhaps you have never stood before a judge nor witnessed a cross-examination. In that case, take your cue from the way patients appeal to surgeons prior to an operation or a cautery" (Step 28). 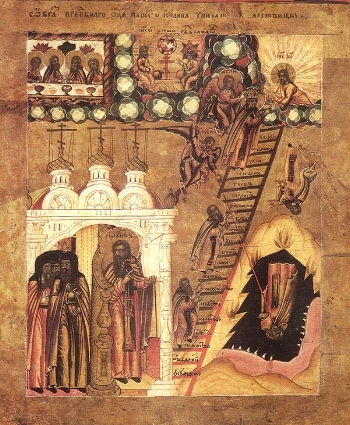 "...The form of Saint John's text--with its 30 Sections or Steps--is suggested by the Biblical image of the Ladder of Jacob, and such an image rooted in the certainties of Scripture, must be taken to imply that despite the myriad difficulties rising up before Him, the way of the monk is not in fact impassable. But it has its own special character and its own particular objectives, and these must be understood from the beginning and accepted for what they are. The monk, after all, "finds himself in an earthly and defiled body, but pushes himself into the rank and status of the incorporeal...Withdrawal from the world is a willing hatred of all that is materially prized, a denial of nature for the sake of what is above nature" (Step 1). "... As if this were not more than enough to cope with, there is a further problem with which the monk (or the Christian believer) must somehow deal, namely the unending assault of demons, of evil spirits hovering and lurking everywhere, restless and vicious, ever on the watch for an opportunity to turn a believer, but especially a monk, away from the path of right conduct. In this matter Saint John is at one with his numerous predecessors and, like the, he refers constantly to the war on two fronts, against the self (ego) and against the hosts of marauding devils. "We have countless hidden enemies--evil enemies, harsh, deceitful, wicked enemies with fire in their hands, wishing to set the Lord's temple alight with the flame that is in it. These enemies are powerful, unsleeping, incorporeal and unseen" (Step 1). As thought comes before speech, so the remembrance of death and of sin comes before weeping and mourning. It is therefore appropriate to deal now with this theme. To be reminded of death each day is to die each day; to remember one's departure from life is to provoke tears by the hour. Fear of death is a property of nature due to disobedience, but terror of death is a sign of unrepentant sins. Christ is frightened of dying but not terrified, thereby clearly revealing the properties of His two natures. Just as bread is the most necessary of all foods, so the thought of death is the most essential of all works. The remembrance of death brings labors and meditations, whereas for those living away from turbulence it produces freedom from daily worries and breeds constant prayer and guarding of the mind, virtues that are the cause and the effect of the thought of death.